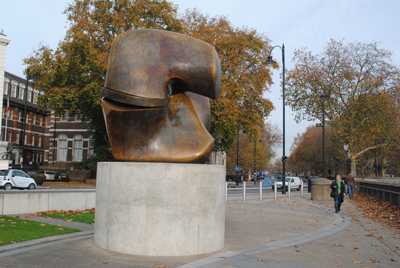 A Henry Moore original, Locking Piece was created in 1963-64 and first located on its current site on Riverwalk Gardens at Millbank, site of the former Millbank Penitentiary, four years later. The bronze sculpture consists of, as the name suggests, two interlocking pieces. There’s a couple of conflicting stories about where the idea for the work came from – in one, Moore said he was visiting a gravel pit near his home at Perry Green in Hertfordshire where he was playing with two pebbles which suddenly locked together (and hence came the idea of a sculpture of two interlocking pieces); and in another, Moore said the idea came from a bone fragment featuring a socket and joint found in his garden. Originally loaned to Westminster City Council, in 1978 the sculpture was given to the Tate Gallery which subsequently decided to leave the piece in situ. It’s one of numerous Moore works in London. For more on Henry Moore’s London works, see www.henry-moore.org/works-in-public/world/uk/london.